The changes brought out to the civil services examination in 2013 led to the reduction of optional subjects from two to one. Till then, optional papers were the deciding factors in becoming a civil servant. Of the total marks for mains, 1200 marks were commanded by the optionals. In the new scheme of things, the optional paper accounts only to 500 marks. The weightage of the optional paper thus reduced from 52% pre-2013 to 24% from 2013. From the statistics it may appear that the relevance of optional paper is diminishing. But, it is far from the truth. Mains syllabus includes four general studies papers. Only few candidates are capable of scoring 100+ marks in each of these papers to secure a call to the interview round. For them, optional paper is truly an optional. Even if they score an average marks in the optional, they can get through. But for many, this is not the case. Optional paper is their leverage. Many candidates score just above average marks in the general studies papers. For them, optional paper is a blessing to score more and stay in the race. This is why even in the new pattern of syllabus optional paper still holds its relevance. But, the big question is how to choose the optional subject vis-a-vis the changed pattern. How to Choose the Optional? 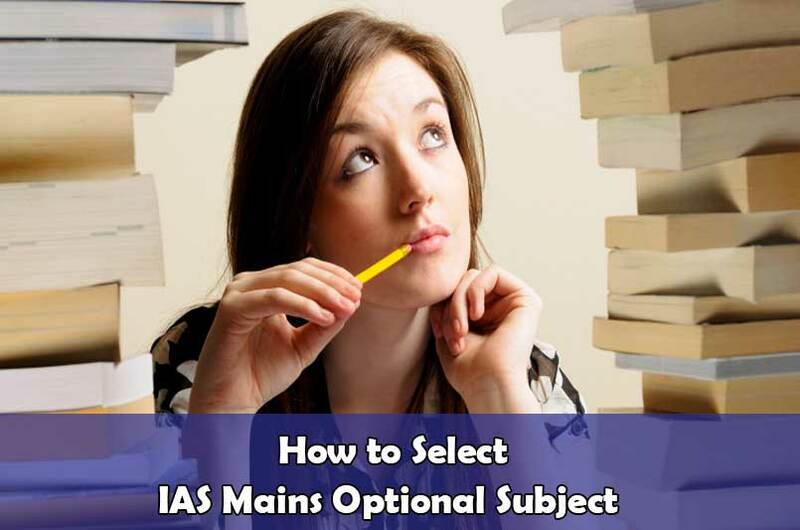 From the above it is clear that the optional subject increases your chances of becoming an IAS officer. Thus, choosing the right optional subject is the key. Often, aspirants are seen choosing the wrong optional due to various influences and falter at the exam. Reason being they are not comfortable with the subject. It is why the optional subject you choose must be comfortable for you. That is, you must be able to study it with ease, understand it and prepare without any qualms. It must be a subject of your liking. UPSC has given a long list of optional subjects to choose from. Give a thorough look into the syllabus of each and every subject. For a productive outcome, choose the one where you feel that the given syllabus can be completed on time along with the preparation for general studies papers. Also, keep in mind point number 1 while doing this exercise. Among UPSC aspirants, trend of the exam plays a role in their choice of optional subject. The exam trend pertains to the optional subjects that did well in the past five years. Currently, subjects like Sociology, Public Administration, Geography, History, Political Science and Psychology are the trend. A cave at here. It is not necessary for you to follow the trend. There are many successful candidates who did not follow the trend. It all comes back to point number 1. The pattern change in the mains exam brought a special problem for the aspirants. The syllabus of general studies papers aligns with many optional subjects. Take for example GS Paper 1. The history portion of this paper can be covered by a candidate taking history optional. Like wise, a pub-ad student can easily align their preparation with that of GS paper 2. What we are underscoring here is that this is also a factor to consider while choosing your optional subject. Time is in valuable for everyone. It is especially so for UPSC aspirants. There is so much to study and revise. If you are short of time and planning to choose an optional that is new to you, better choose the one for which you can take best ias coaching. Studying an optional subject from scratch is a tough task. Coaching facilities aid you in saving time if you could use their services to the fullest. So, consider coaching as a factor while choosing the optional. The factors mentioned above are not the only factors to consider while choosing optional subject. There are many more depending on the individual. But, the above factors are worth considering either individually or combined for better scoring prospects. If you feel that there are other factors to consider, please share with us.